The 'Expert' mattress falls into our 'Exclusive Range' for those who are looking for price and quality combined. It is 31cm deep, pocket sprung and cushioned with a combination of memory foam & Thermo 'Cool Gel'. Cool Gel helps to keep the mattress at a cool comfortable temperature. Memory foam moulds to the contours of your body, perfect for relieving pressure points such as your hips, shoulders and knees. Some of our biggest selling mattresses are designed with the independent pocket sprung system. These are extremely popular with people who suffer from back problems. Unlike conventional springs (which are all connected) pocket springs are completely independent from the one next to it. Each spring moves differently to the other depending on where the weight is distributed on the mattress. So whatever position you move to, the springs follow your body shape. It also has two separate sides to use, one firm one medium. As with all our mattresses, the 'Expert' comes with the European Oeko-Tex certificate of approval. "Solid, Rigid, Re-enforced, 3D breathing filter!" 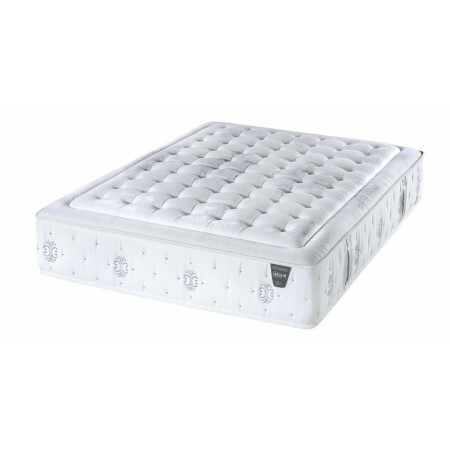 This base is a rigid and ideal design for the more heavier or pocket sprung mattresses. Re-enforced with steel strenghtened bars hidden under the fabric and a 3 dimensional breathing cover to avoid any humidity between mattress and base. It is 6cm deep and comes in a neutral Beige colour. It is also available in various types of feet choices ranging from 10cm to 30cm height in metal or wood. It has 6 feet in all sizes.